This season certainly did not pass without a few lessons learned. 1. I am a terrible cookie decorator. 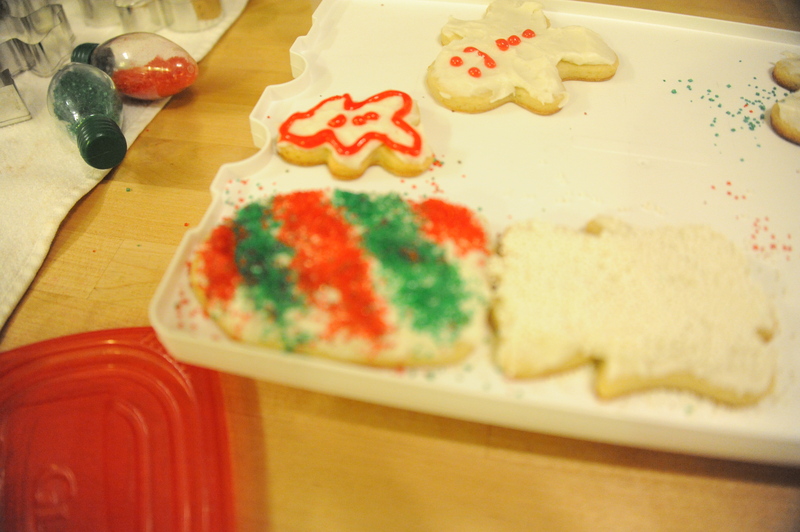 It could be that I don’t have a steady hand – hence the crime scene outline instead of a gingerbread man. Not to mention by the time I’ve made the cookie dough, rolled it out, cut shapes and baked it, I’m tired. Who wants to decorate? If only the frosting/sugar cookie combo wasn’t so delicious. 2. This is not new, but I was reminded that I think big, some might even say I overcommit. This of course is not bad, but I usually underestimate what it takes to execute. Instead of spending $150 on a Barbie house that I would one day end up selling for$5, I though I would make one out of white cardboard boxes. My imagination is much more awesome than reality. I mean it’s not all bad once you add twinkling lights, some furniture and close one eye. Right? 3. Time flies. Just when you thought you were ahead of the game, it’s one week before Christmas and the Barbie house you started is not even a third of the way done. Don’t be fooled you are never ahead of the game during the Holiday Season. Even when you are ahead, something always comes up. Or in my case, you just think you are ahead. 4. Whatever I try to accomplish that I don’t want my child to be privy to means that I will get zero sleep during the month of December. The child that in November was falling asleep around 8 would not fall asleep until at least 9:30. Everything has to come out of hiding which means you have begun building a Barbie house or wrapping presents at 10:00. Zero sleep. 5. The Holiday Season is a much magic as it is about a miracle. It’s fun and merry but also hopeful and mysterious. 6. If you want to surprise your husband with a Christmas gift don’t use the Amazon account you share. It was Amazon Prime people. What was I supposed to do? Pass up the two-day shipping? 7. The Holiday season inspires all sorts of madness. I mean what sane person decides to bake 3 different types of cookies on Christmas Eve? And if that weren’t enough, what sane person then decides to go to Wal-Mart to get ingredients for said cookies. Madness. Holiday cookie madness. 8. Kids will survive on a couple of gifts instead of many. It’s not that my child didn’t want a hundred gifts. Every single toy in the Target and Wal-Mart circular was highlighted and circled. Twice. Parenting is a funny thing. You want to buy your kid the world, to not go without, but then you have brief glimpses of what life will be like with a child who never went without and it’s not pretty. But guilt steps in. 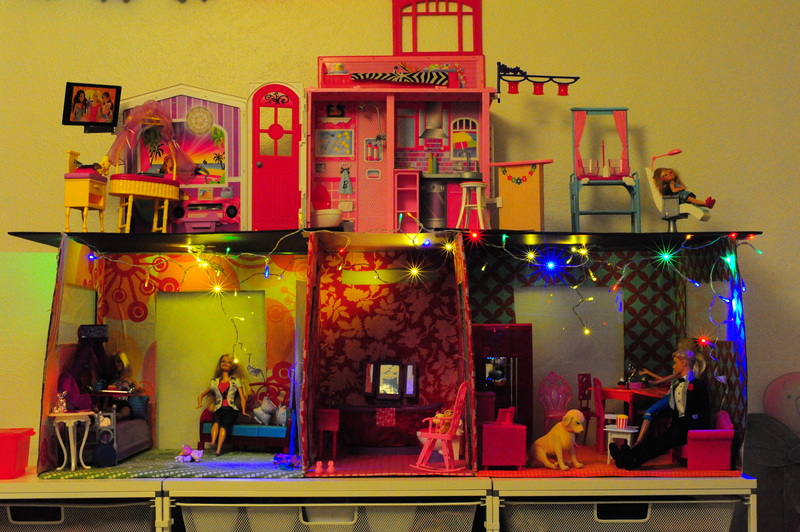 You are depriving your child of those fabulous plastic toys he/she has always wanted. Then fear joins in. What if they never forgive you just like you see in all the movies? Scarred for life, destined for a life of drugs and dead-end jobs or worse living in their old room at the age of 36 with no future in sight? Insert silent scream. Just when you pull out your credit card to buy everything in the store, sanity hits you. It’s ok to not have it all. To go without that nth toy, because the reality is you are lucky. My child will probably be ok with just one gift instead of 10. Or I just need to be ok with it. And maybe just maybe, instead, it would be better to share our good fortune with others instead of keeping it to myself. This entry was posted in Learning to love what you need, Life Lesson and tagged Barbie, Cookies, Holidays, Target, toys, Wal-Mart. Bookmark the permalink. Such fun reading! I heard about a great deal for buying kids Christmas presents today: have them make a list of everything they want…….buy it for them for Christmas and then have them pick 3 things……everything else goes to other children who don’t have a family Christmas……I can hear Lola now! !